This is a guest post written by Scott Wills, Marketing Director at Datazeo, a Juniper Systems partner. Datazeo specializes in providing smart meter-reading solutions for water utilities. With water shortages prevalent in many areas across the country, the monitoring and management of water usage is an increasingly pertinent topic. For water utilities, having water usage data from various service areas that is both current and easily accessible within a single system is essential. However, it’s also a persisting challenge, due to the fact that multiple water meter reading technologies and systems are being employed at any one time, forcing utilities companies to manage each system separately. That’s where Juniper Systems’ partner, Datazeo, is changing the game for water meter reading with its new SWiM® (Smart Water Infrastructure Management) app and cloud-based MDM system. Unlike any other solution on the market, SWiM brings manual handkey, Versaprobe™ touch-read, radio AMR (Automatic Meter Reading), cellular AMI (Advanced Metering Infrastructure), and other technologies together into one system, providing a single interface for utility operators. SWiM is designed to connect legacy systems with future technologies, providing integrated data and analytics from one master data platform, without having to abandon older systems that still function efficiently. “One of our mid-size utility customers in North America has expanded its service area as its surrounding cities have grown over the last 40 years or so. Whenever a new community was developed they would go out to the market and purchase the latest meter reading technology for that part of their service area. Fast forward four decades, and this utility is juggling three different systems and wants to adopt a fourth. Before SWiM integrated everything, their office staff had to do all meter data management administrative activity in triplicate and just short of replacing all three systems, they had no path for adopting the next generation of meter data collection, which is looking like it will be spot deployment of cellular-connected AMI meters for high-use consumers. “Next, add the challenge of engaging consumers to reduce water consumption and utilities really have their hands full with technology challenges. We worked closely with the utility and our conservation partners to include consumer-facing notifications for high use, leaks, and penalties to fill that need. We are starting to see how these are a huge benefit to consumers as they work to conserve water in drought-affected areas. With the entire water industry clamoring for economical and efficient ways to manage their largest revenue stream (water use), Juniper Systems is excited to be part of the release of SWiM. 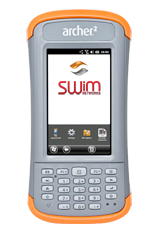 By connecting our Archer 2, Allegro 2, and Cedar CT4 handhelds, Juniper Systems can now deliver three integrated data collection options for water utilities (manual, touch-read, and radio meter reads) to utilities using SWiM. To learn more about SWiM, contact Juniper Systems or Datazeo and we’d be happy to help.